Cosy accommodation for 2 in quiet rural setting but close to all amenities. Basic but fully equipped stable conversion with some original features. Downstairs open plan kitchen and lounge with adjacent bathroom. A picture door leads to private rear garden. Upstairs is a large bedroom with views to ancient church. St Columb is an ideal location to explore the beaches of the North Coast, It has 4 pubs within walking distance, 2 fish and chip shops, a Chinese take away and a Pizza shack, 2 butchers and a 7-11 Co-op. So no worries about drinking and driving in the evening.There are a number of bus routes from St Columb to popular destinations, taxi from Newquay about £12. The owner is on site and happy to deal with any problems or give local attractions. The rear garden is yours to use, it has seating and a fire pit. The other grounds work as a smallholding. You are welcome to walk among the geese, not many people do. Linen and towels are provided. Private off road parking is provided. I (Elizabeth) am a recently retired social worker, I have lived in St Columb for 32 years and have seen most of the County. For about 30 years I was a keen scuba diver and then became a keen horse rider. Together with my husband Bob we had our own horses. Bob is a retired Podiatrist and handy man whose hobbies are cooking and tending the smallholding. This property is not for everyone, it is compact downstairs and the floor is a painted original stable floor, the bathroom works and has now been updated. However people who have lived in it have always found it very serene. Love it or hate it I think may apply. In the past it has been a long term let. This is the third year of letting as we have hosted so many delightful people from all over the world. Not much has changed except the shower room has been updated. Obviously the price is reasonable.The location is well worth trying, being close to the sea, however like elsewhere, it sometimes rains in Cornwall! We think April and May can be superb not too busy and a riot of colour, June is usually good. July and August are busy but there are ways of avoiding the traffic. Electric shower wash basin and toilet wall heater. The bathroom has been updated. 2 bath towels and 2 hand towels and tee towels included in hire fee. Open plan with two reclining chairs, flat screen TV. Salt pepper vinegar etc plus starter pack of milk coffee and tea. Available for 4 people. Sharp chefs knives Breakages will be charged at cost. Small table for two in open plan lounge diner. Outside furniture for 2 chairs and table. Some in stable 300 others available. 1/2 acre and second acre. Wonderful host in Liz who was friendly and informative. On arrival a lovely touch of 6 eggs and milk in the fridge. Stables are not luxurious but that didn't concern us at all. It was very clean and and a television in the loft bedrooom was great to watch tv in bed at night. There is everything you need to have an enjoyable stay, the kitchen is fully equipped and plenty of heaters to keep you warm. It is located a 2 minute walk into the centre of town which has everything you need. Provided us with an excellent base from which to re-visit our favourite haunts in Cornwall. The owners were unobtrusively helpful and friendly. The substantial garden to the rear looked very attractive although during a chilly few days in April we didn't make the best of this. We stayed for 3 nights in August and we had a lovely time .A great property witn lots of character .Very welcoming and comfortable . 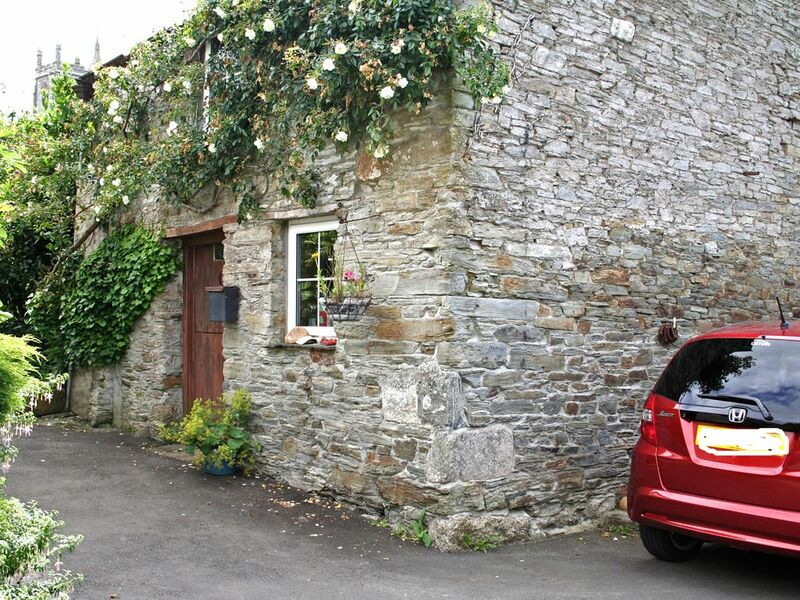 We've just spent an all too brief stay in this lovely converted stable. The accommodation is, as they say, deceptively spacious, particularly the bedroom upstairs. The kitchen area is very well equipped with everything you would require. The living area is comfortable and relaxing, and the toilet/shower room more than adequate. The whole accommodation is spotlessly clean. Outside to the rear there are extensive grounds with lawns, vegetable plots, herb garden and fruit trees. You can wander at will and enjoy the peace and tranquillity of this lovely situation. Saint Columb Major is a quiet, attractive town, and an excellent base for exploring the county. Bob and Liz are excellent hosts. They are there to help if need be, but are certainly not obtrusive. We loved our stay here and would thoroughly recommend it. Thank you for such a complimentary review. We are very pleased you enjoyed your break it was our pleasure to host you. The stable had everything we needed and a lovely garden as well. It is very convenient for all the north Cornish bays. The village has a CoOp within walking distance and we can recommend the fish and chips shop! Liz is very thoughtful. Thanks for the 3 stars, St Columb is a town. Fabulous location and perfect hosts. St Columb is midway between the busy resort of Newquay and picturesque Padstow, yet remains a peaceful location even in the height of the season. Located within easy reach of the wonderful varied beaches of the North Coast and access to the South Coast and such attractions as the Eden Project and the Lost Gardens of Heligan. It is close to the Camel Trail for cyclists, walkers and birdwatchers. The airport is less than 4 miles away. Linen and towels can be provided at a charge of £10. Beach towels are not provided but can be hired if required.